What a day! 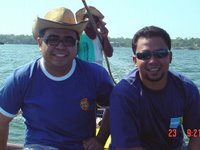 I'm about to leave the Bolinao Marine Lab of the UP MSI for my trip back to Pampanga. It seems my laptop crashed so I'm using Sasa's for the meantime. Just my luck! Anyway, I helped Sasa in the field this morning. 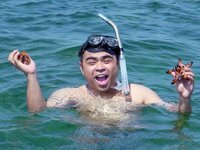 At the moment, he is a research assistant for a sea cucumber breeding projet of the DA-Bureau of Agricultural Research. 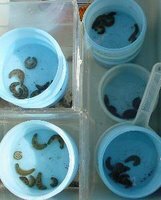 They are developing culture of a certain species of sea cucumber - Holothuria scabra, not only for commercial purposes but for re-seeding depleted stocks as well. One thing the Philippines fails to realize is its potential competitive advantage in aquaculture. The said sea cucumbers we were working on are among the most expensive, if not the most expensive in the market. The photo on the right are young H. scabra sea cucumbers that were bred at the lab which we were going to plant in the research pens near Santiago Island. If only the goverment spent more on research and development, not just in aquaculture, but in various fields since we have so much raw talent and natural resources available here in the country. We took a pump boat from the lab to waters near Santiago Island where research is ongoing on various projects. Another project which they are working on is the breeding of sea urchins for re-seeding as well. Stocks have been depleted (see comment below) since fishermen overcollected them in the 80s and the 90s for the Japanese uni market. While Sasa and his assistants were putting the young sea cucumbers in their pens, I went snorkelling amongst the sea grass to check out the wildlife and saw quite a number. In my hand are a sea urchin - Tripneustes gratilla, and a starfish - Protoreaster nodosus. The urchin in my hand is the one they breed for uni. After that, we went to check out the pens of the older sea cucumbers to dig out for them. These were brought back to the lab for monitoring and weighing, then thrown back into the pens. Yikes! I didn't realize digging for sea cucumbers would be hard since they burrow themselves under the sand. It took us quite a while to find them. Hehe! When we finally got all of them, we went to another side of Bolinao to harvest Sargassum. There was none on the side we were on since most of it was already consumed by the sea urchins. 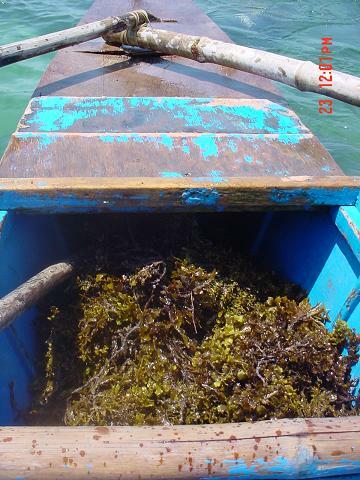 The sea weeds are processed in a blender and is used to feed the sea cucumbers in the hatchery. We're now back at the lab. Now that Sasa and his assistant are weighing the sea cucumbers, I'm typing my blog entry. Hehe! Im interested in sea cucumber. I hope I can visit you someday to see Sasa's work. I understand the going price right now is P2,000 per kilo!? My father-in-law used to have a fishpond and we grow fish, crabs, tigerprawns, etc. He has exchanged it recently with a mango plantation. 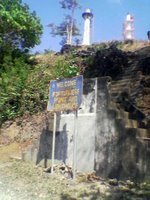 But the uncle of my wife has just acquired a big property in Samal Island. It has an ideal cove where we can farm sea cucumber. Hi Councilor! I'll inform Sasa. The project is a study of the DA-BFAR. my project is looking at developing the culture/farming of H. scabra and not "trying to find out if a certain species of sea cucumber - Holothuria scabra, could be bred so that it could be sold to the market." because it is already being bred in other countries (i.e. Vietnam, Solomon Islands, etc...). also we are developing the culture not only for commercal purposes but also for re-seeding purposes! second and pretty much the same is the one about urchins. there are several cages in Lucero with urchins, and i know of 2 pojects that have cages/pens there. 1 is "Sagip Lingayen Gulf Project" which as its names implies is trying to save Lingayen Gulf. Their cages are there to grow the urchins for re-stocking purposes. Since the urichin industry is lucrative, many local fisherfolk started collecting them and i think it was in the 80's or 90's when we were exporting by the tonnes! so wild stocks were depleted and Sagip is trying to restore the orginal numbers or something like that. another project that has cages there was the project my girlfriend, Talna was under (no funding at the moment kaya baka hindi na ituloy). as i mentioned at Dj's party, she was studying the genetics of the urchins. so no one is breeding for the Jap market!!! we develop the technology but we never go commercial, i think bawal yon kasi academic institution kami or something. i guess that is it! enjoy your stay there and ingat! later batch! By the way this is gonna be my second comment, the other one was 'bout vigan. Anyways, I enjoyed reading yer blogs. This is my dad's hometown. We used to go here a lot, and my extended family are very popular in this place. Just ask for 'Celeste'? hehe I dunno if they're still in politics , its been awhile since ive seen them. Anyway, yer posts in this and the vigan just made me reminisce. Okay, gud luck again in yer journey!!! hi sir ivan/sir sasa! 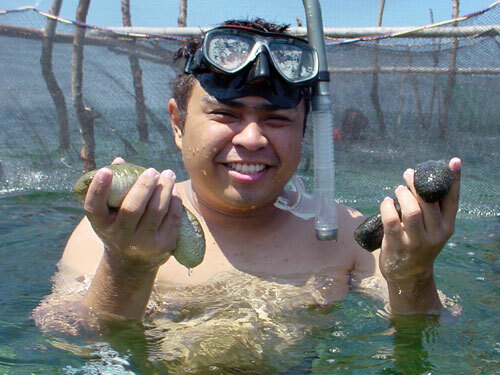 I am a senior student from UP los banos and is currently working on my thesis which is a study on the viability of establishing a sea cucumber farm in quezon. kailangan ko po yung mga data regarding how a sea cucumber farm operates. as in lahat po ng information which will be relevant to the study. I am also planning to visit the sea cucumber farm in Bolinao, the thing is I don't have the contact person. Di ko po alam if I will be accomodated or what not. Matutulungan nyo po ba ako sir if ever? That would mean a lot to me sir. Salamat po! this is my email add: mhalhot_13@yahoo.com.ph. Thanks and God bless you! thanks po, this would mean a lot to me. im a student from PLM ask ko lng po kung nagcucultivate kau ng Diadema setosum.. and how much po yung price nya? i need them for my thesis salamat po..
please e mail me at michael.pabrique@yahoo.com.ph for more information. please indicate your contact no. and address... thanks.